In what is essentially a continuation of litigation prior to the 2015 case freeze, the SEC has filed a renewed default judgment motion against DFRF Enterprises. In their February 1st motion the SEC argues that DFRF Enterprises is in default, because Daniel Filho filed a response to their original compliant on behalf of the company. Filho is not an attorney, and DFRF is not permitted to proceed as a pro se defendant. The Commission requests that the Court enter a default judgment against DFRF. 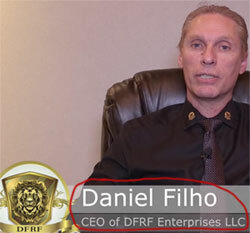 Daniel Filho (right) owned and operated DFRF Enterprises. Following criminal proceedings drawn out over a number of years, Filho was declared incompetent to stand trial in July, 2018.
received no proceeds from gold mining operations. DFRF paid no insurance premiums to Accedium. DFRF received no proceeds from a credit line with Platinum Swiss Trust. DFRF made no charitable donations. DFRF did not register its stock with the Commission. Defendants Filho, Valdes, Dalman, Jesus, and Da Silva knew or were reckless in not knowing that their representations on behalf of DFRF were materially false and misleading. Between June 2014 and May 2015, DFRF raised more than $15 million from more than 1,400 investors. DFRF had no independent source of revenue except the money received from investors. During the same period, DFRF paid approximately $1.6 million to investors for the return of principal or purported monthly payments. DFRF made those payments only by recycling a portion of the funds received from other investors. In other words, DFRF used money received from some investors to pay other investors – the hallmark of a Ponzi scheme. The SEC argues that because DFRF Enterprises has defaulted, that it’s ‘factual allegations must be taken as true‘. The Commission requests that the Court enter a final judgment as to DFRF (in the form submitted herewith) that includes a permanent injunction against future violations of the relevant securities laws, an order to pay a total of $17,669,640 for disgorgement and prejudgment interest, and an order to pay an appropriate civil penalty. As per the SEC vs. DFRF Enterprises case docket, an Alternative Dispute Resolution Hearing has been scheduled for May 7th. I’m not clear on whether the SEC’s default judgment motion will be ruled on prior to the ADR hearing. I’ll be checking the case docket periodically though so stay tuned for updates.